I expect you think this will be a post on fugu aka Japan's notorious poison puffer fish. Well, despite the fact that Mr Fugu sits happily on my banner, I've never tried fugu nor am I in the least bit inclined to do so. God knows I love food - but not quite enough to risk death or even paralysis. I know, what a killjoy. However, I have tried Japan's most dangerous (rather than deadliest) meal and blow me if it wasn't the best experience I've ever had in terms of both taste and fun. What am I talking about? 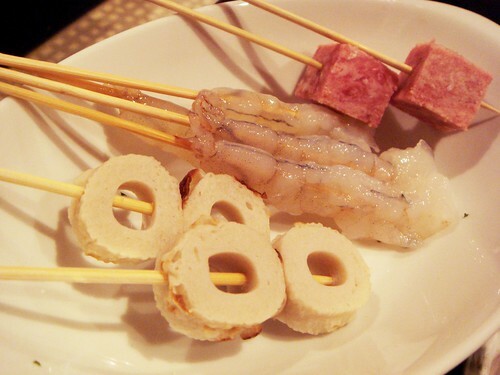 All-you-can-eat DIY Kushikatsu aka Kushiage. Just plain old kushikatsu is a fantastic thing in itself - you pick various sticks of panko-breaded eats and they're fried to order in front of you - nothing beats the flavour of a freshly-frittered king prawn. 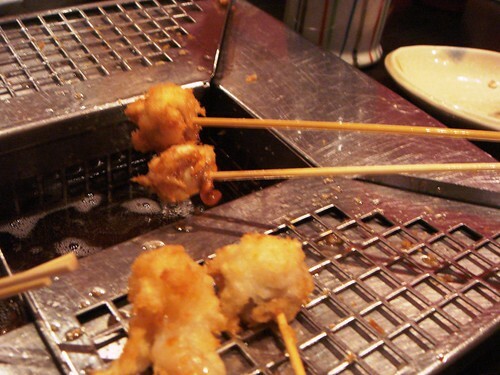 DIY kushikatsu means you fry the kebabs yourself, at your table, with next to no safeguards. 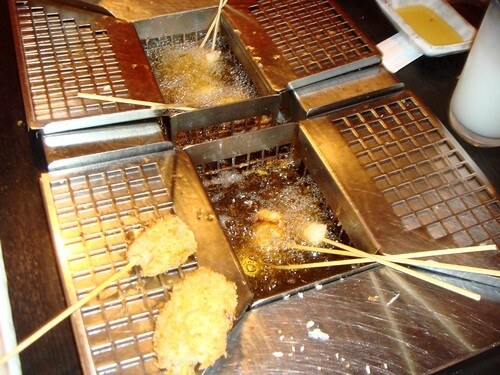 All-you-can-eat DIY kushikatsu means you're trying to deep-fry as many of the buggers as you can in a set time limit - an awesome combination of health and safety nightmare and purest joy. 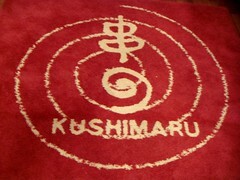 Kushimaru is one such joint in Tempozan Harbour Village in Osaka Bay. 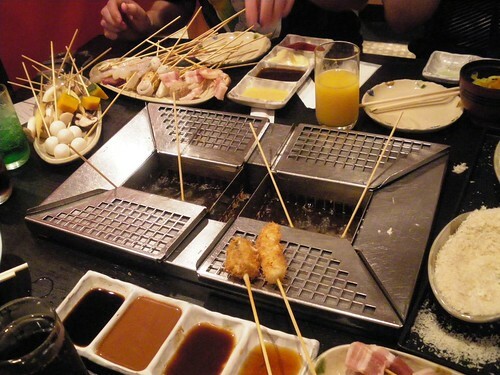 As we sat down, the waiter instructed us to dip each skewer into eggwash and then into panko breadcrumbs before sticking them to frazzle away in the deep fat fry pits recessed into our table. And then, for a mere ¥2100 per head (about £15/$20) we were let loose to rampage for an hour and a half. The choice of kebabs was truly epic. Meat included wagyu beef, pork belly, chicken, scallops, clams, squid, kamaboko and prawns. 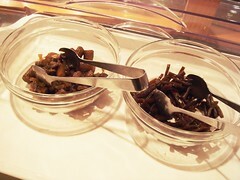 Veg options included new potatoes, okra, bamboo shoot, quail eggs, shiitake mushroom, kabocha squash, baby corn, aubergine. 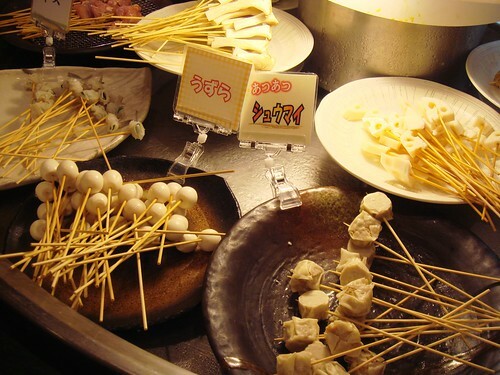 They even had takoyaki and gyoza on sticks, just in case you felt one crispy-fried coating wasn't enough. 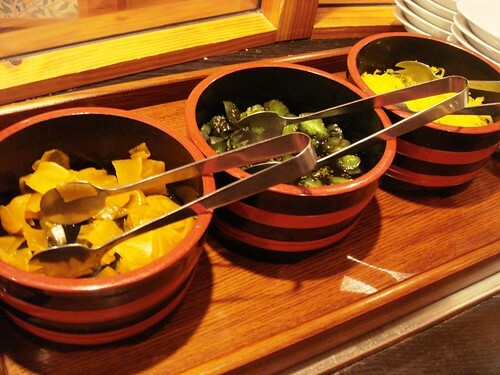 As well as foods to fry, there were side dishes of pickles, hiyayakko tofu, miso and other soups, rice and various seaweeds, and even chips. 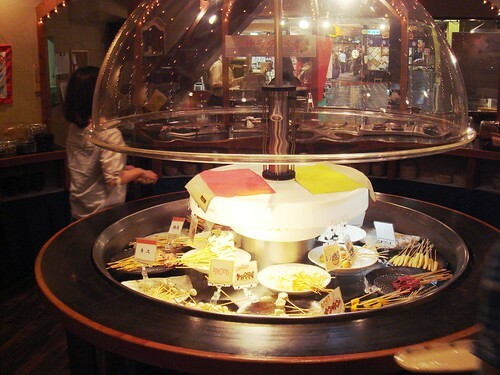 Our all-you-can-eat pass also covered unlimited soft drinks (nomihodai) - lurid green melon soda, Calpis Water and Calpis Soda, iced and hot coffee - as well as dessert comprising Mr Whippy style ice cream and kakigori. Oh kakigori. I could sing songs about kakigori. 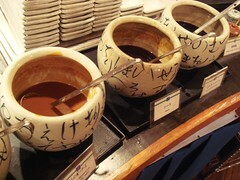 Sure, it's just shaved ice and syrup, but its fleeting kiss is one I yearn for even in the depths of winter. Anyway, by the end we were spattered with eggwash, hot oil and crumbs (my mate Sati suffered minor burns which made some potential diners think twice and scurry off), but nevertheless we were so very happy. "If your child survives, reward him with an ice cream"
Kushimaru is now my favourite restaurant in the world - I can't think of anywhere I've had so much fun and good food at the same time - and the real risk of getting third degree burns just adds to the excitement. Of course there's no way such a place would ever be okayed in the UK, which makes me kinda sad. Directions - Go to Osakako station and head for the largest Ferris Wheel in the world - Tempozan Harbour Village is next to it and the restaurant is upstairs. There's also an enormous aquarium there called Kaiyukan where you can watch sea otters eating food off their bellies. 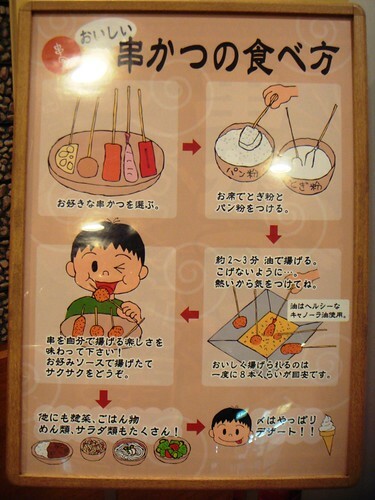 Wow AYCE kushikatsu sounds so dangerous I think I will end up like Augustus Gloop! The pic of the the pickles made my mouth water! 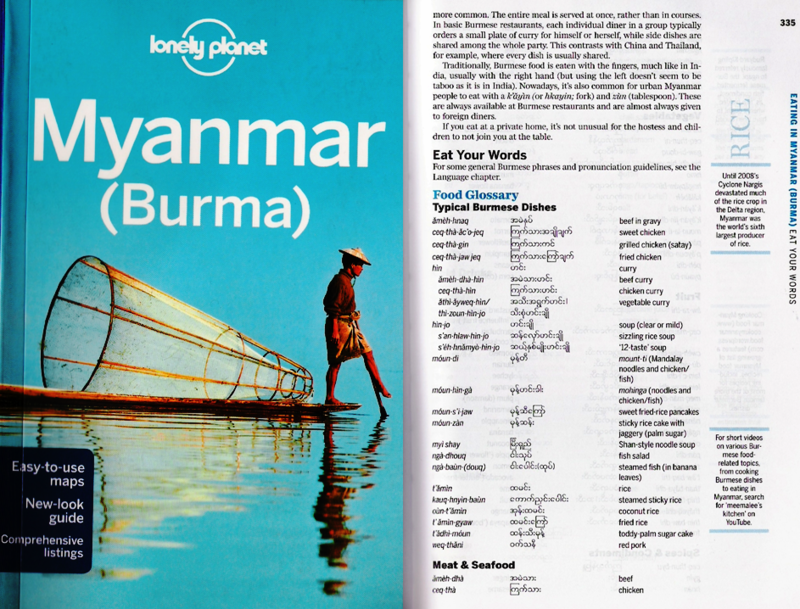 omg, I read about places like this but thank you so much for the pictorial guide! What a glorious glorious buffet - but only 1.5 hours? Was that enough time to consume all these fried goodies? Oh my god, how utterly fantastic. I want I want I want!!! :) Thanks for this post, it really reminds me that sometimes, reality can be stranger than even my dreams, and those are plenty strange! Incredible. You'll never see this in Britain with all the health and safety legislation. Have you read Anthony Bourdain's account of eating Fugu in 'a cook's tour'? YUM & FUN! What more could you want? Japan, here I come... soonish! Great post. Sati has a permanent scar from that day. Thats no lie! @DennisK - And end up falling in the hot oil? Ouch! @Su-Lin - Yes and no - I could have stayed there all night but I was pretty stuffed by the time we left! @Kavey - I actually used to have nightmares where I'd be at buffets and would pile my plate high and then I'd wake up before I got to taste anything. @Dan - Damned health and safety. I love Bourdain on TV but I really need to read his books - thanks for reminding me. @EssexGourmet - Go if you get the chance! @Roti - Poor Sati. But it was worth it, weren't it, Rotan? @Gav - Fried stuff rocks. I think you're right! Just looking at the photos makes me want to keel over and die. Husband thinks it's an excellent idea though. I was only reading about this the other day in my Kyoto guidebook & wondered if it might be a little dangerous. Now I can see from your photos that it looks 'relatively' safe! Brilliant- a restaurant full of deep fried stuff!! When is this coming to the UK?! @Helen - It's totally worth the scars. That looks great! The DIY element would definitely add a bit of fun to proceedings - I tried Shabu Shabu once a while ago which is slightly similar in that regard, little gas-burners at your table, pots of broth, and shrimps/beef to dunk in them 'til they're cooked. In a funny sort of way this kind of eating is perfect for dates as well because you've got a meal and and you've got an 'activity' in one - and it's certainly memorable as well! Health & safety would never allow it here though, you're right. 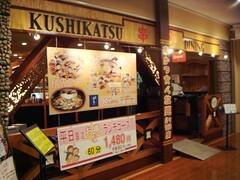 I wonder if perhaps there's a market for underground Kushikatsu joints in the UK - a "Fryeasy" maybe? I just discovered your blog through London Food and Drink. My name is Bethany and I write the blog http://www.dirtykitchensecrets.com here in London as well. 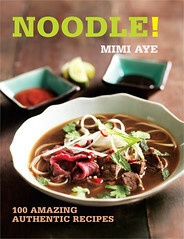 A few other bloggers and I are organizing a conference on Food Blogging on the 28th of November, 2009 in London. We would love it if you could join us. Depending on the number of food bloggers who RSVP, we hope to also have guest speakers talking about relevant issues to Food Blogging such as “How To Improve On Food Photography” or “What Makes A Good Food Blog” amongst others. In any case, it will be an opportunity to meet other food bloggers, some of which are coming from France, Germany and even India, and network, eat delicious food and have a good laugh. @Alex - Ooh, I lurve shabu shabu! Where did you have it?? Somewhere in New York - can't remember exactly where though. Been trying to find a comparable place here in London ever since! I know I'm a bit late coming to this party but I just love this post - and I want to eat this meal SO so badly. Wow. @wouldliketoeat - Thank you! Am hoping to go back in October!